Giclée (“zhee-clay”) is a French word meaning “that which is sprayed”. The process is a highly advanced method of fine art reproduction using archival dye based inks. A computer controlled, sophisticated ink-jet printer designed specifically for this process creates a near-continuous-tone image on fine-art media such as canvas and watercolor paper. Why is a Giclée More Expensive Than a Litho Print? The cost of printing a single Giclée print is set by the printing company and is substantially higher than the unit cost of printing a photo-mechanical litho. An entire edition of litho prints is produced and paid for up front so the larger the edition the smaller the unit cost. We produce Giclée prints one at a time as ordered. The Giclée printing process on 140 lb. Arches archival watercolor paper reproduces the original painting with amazing clarity and color. Rich Thistle Giclée prints are offered in very limited editions of 100 units for the aviation images and 300 units for the landscapes, creating a more exclusive product than larger litho editions. Giclée technology is a sophisticated, cutting edge process and therefore expensive. The resulting quality is unsurpassed with the look and feel of original fine art. Why is Delivery Time so Much Longer? Giclées are produced individually as ordered and not pulled from an existing edition inventory. The process takes at least 2 weeks, or possibly more, and shipping time must be added to that. Why choose a Giclée print? Image quality, sharpness, and color saturation place these prints in a league of their own. The Giclée process offers amazing control of color and hue saturation of the images before they are printed. Color limitations imposed by the screening process do not exist because millions of colors are possible when a Giclée is produced on the specially designed printers. Dots created by this process are so tiny and numerous they are not discernible to the eye. Basically, a Giclée print is a continuous-tone print because it shows every color and tonal range. For reproductions of original artwork, the technical part of the process typically begins in one of three ways. The artist maintains control over every aspect of the image: from simple burning and dodging to complex color manipulation. When all refinements are complete, the newly created electronic file is sent to a high performance printer. Using a quality watercolor paper or canvas, longevity of eighty – five years can be achieved. How does a Giclée print differ from a photo-mechanical lithograph? 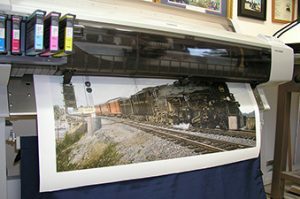 Giclée prints are created using specially designed, computer controlled printers by “spraying” archival inks onto archival watercolor paper or canvas. The result is a very high-quality, near-continuous-tone print on fine-art media, which much better mimics the surface qualities and integrity of the original. Photo-mechanical litho prints are created by generating a large-format positive transparency of the original work using specialized camera equipment, or by scanning paper originals on a large drum scanner. From this transparency or scan, color separations are created from which at least four – or more – printing plates are developed, for each color required . These plates are used on a 4 or 6 color offset printing press to produce several hundreds or thousands of prints during a press run. The result is an image comprised of a series of very small dots, visible under magnification, which recreate the colors of the original image. Most newspapers and magazines are printed by this process. The full edition of prints is then signed and numbered by the artist and stored as inventory. Archival characteristics or permanency is a very important factor in fine art printing. From the beginning, Giclée prints have been under the critical microscope. The inks used in the early days of digital printing (using Iris printers) were beautiful but highly fugitive, lasting only two or three years before noticeable fading began. Unfortunately, some printing companies used these inks when printing fine art prints, which led to the perception that Giclée, as a rule, tended to fade. Information gained from extensive research and the explosive growth of the industry has spurred the development of a new generation of fine art inks which offer all the permanence expected of a work of fine art. It has also infused the art community with confidence about Giclée and rendered ink permanence a non-issue. The market for Giclée prints is growing fast. Beyond the aesthetic reasons for this explosion are several basic business reasons. From a practical standpoint, this method of printing is faster and more cost-effective than traditional fine art printing methods. Images can be reproduced in small quantities and stored electronically. This means an artist/ gallery can re-order “on demand,” with a consistent product guaranteed every time. Gone is the need for an up front printing cost to produce an entire edition at once and maintaining a large inventory. Giclée has also proven to be a good, affordable way to offer more images for art lovers, often unable to afford the cost of original work. 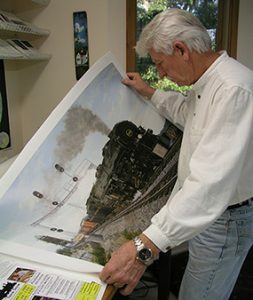 For traditional artists, the Giclée process yields beautiful reproduction prints. For digital artists, it is a method of creating output of a caliber expected by galleries and customers. It is unlikely that Giclée prints will replace serigraphs and photo-mechanical lithographs but they will continue to capture an increasing share of the fine art print market. If acceptance of these prints by artists, galleries and museums world wide is any indication, Giclée prints could be in your future.